After a fairly dismal harvest from the allotment this year, the only crop that has made it to the bleak midwinter is the trusty leek. The brassicas were massacred, the carrots and parsnips failed and what little there was of a potato crop has already been eaten. So, on a blustery Christmas Eve morning walk with the dogs, I stopped off at the plot to harvest the last of the leeks, determined that something home-grown would make it to the Christmas dinner table. And there they were, standing upright in splendid isolation: the final four leeks. 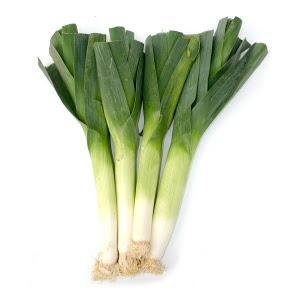 If the nuclear winter ever arrives, I swear it will be the leek that will be the first to regenerate, condemning generations of survivors ever after to wear leeks in their buttonholes in remembrance. And in the austere spirit of the times, I will make use of the whole vegetable. Here are two recipes: one that uses the traditionally eaten stem, the other the green leafy tops. Trim the leeks but set aside the green tops. Thinly slice the leeks and chop the onion. Gently fry the leeks, onion and thyme until soft. Add the wine and simmer for 5 minutes to reduce. Add the cream and warm through. Put in an oven dish, add the cheese and bake for 25 minutes at 180c. The green tops of leeks usually end up in the compost; but washed and cooked in butter they are a great addition to the table for the midwinter feast on the 25th. Wash and finely shred the leek tops. Melt a couple of ounces of butter in a saucepan. Add the leeks and cover. Cook over a medium heat until the butter bubbles. Stir and turn to a low heat. Season with salt and pepper and cook for a few minutes more until soft.